Treat dry, brittle hair to Joico's Moisture Co+Wash Whipped Cleansing Conditioner; a rich, creamy foam that delivers the benefits of a gentle shampoo and nourishing treatment in one. Fortified with Jojoba Oil and a blend of Shea and Murumuru Butters, the formula replenishes dehydrated, thirsty locks, whilst resurfacing marine botanicals and minerals restore the hydro-lipid barrier for softer, stronger strands. Its unique dispensing system delivers the perfect amount of aerated cream, just enough to preserve the hair's natural oils each time and reducing breakage by up to 59% to reveal healthy-looking, frizz-free tresses with enhanced shine. 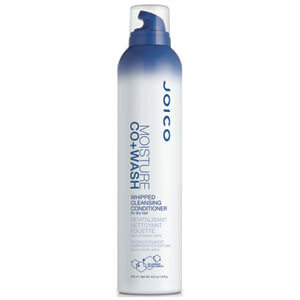 Work the foam into your thoroughly wet hair from roots to ends, then rinse. Water/Aqua/Eau, Cetearyl Alcohol, Decyl Glucoside, Hydroxypropyl Starch Phosphate, Behentrimonium Chloride, Isobutane, Glycerin, Ceteareth-20, Sodium Cocoamphoacetate, Butyrospermum Parkii (Shea) Butter, Simmondsia Chinensis (Jojoba) Seed Oil, Hydrolyzed Keratin, Cocodimonium Hydroxypropyl Hydrolyzed Keratin, Astrocaryum Murumuru Seed Butter, Pentapeptide-30 Cysteinamide, Pentapeptide-29 Cysteinamide, Tetrapeptide-29 Argininamide, Tetrapeptide-28 Argininamide, Hydrolyzed Algin, Sea Water/Maris Aqua/Eau De Mer, Chlorella Vulgaris Extract, Bis-Diisopropanolamino-PG-Propyl Dimethicone/Bis-Isobutyl PEG-14 Copolymer, Bis-Cetearyl Amodimethicone, Quaternium-91, Amodimethicone, Citric Acid, DMDM Hydantoin, Polyquaternium-7, Tetrasodium EDTA, Myristyl Myristate, Polysorbate 20, Butyloctanol, Trideceth-12, Cetrimonium Chloride, Ceteareth-7, Ceteareth-25, Magnesium Nitrate, Stearyl Dihydroxypropyldimonium Oligosaccharides, Propylene Glycol, Methylchloroisothiazolinone, Magnesium Chloride, Methylisothiazolinone, Isopropyl Alcohol, Limonene, Benzyl Benzoate, Fragrance/Parfum.